Guests visiting CSCUSA member resorts in January will find package deals on rentals, lift tickets, and professional instruction, and in many cases resorts will reward successful first-time learners with a complimentary season pass after completion of a multi-day lesson program. Here is a summary of the Learn to Ski and Snowboard activities and offerings at CSCUSA member ski areas. Every Sunday in January and February, Arapahoe Basin will have special lesson and rental packages for first-time skiers and riders. All packages include lift ticket, rental and lesson. Lessons are half-day, morning only (10:00am-12:30pm). For information on A-Basin’s Learn to Ski and Snowboard Month deals, visit http://www.arapahoebasin.com/ABasin/lessons/lssm.aspx. One Run Lessons: Guests at A-Basin of any age and ability are matched with an instructor for one run from the Black Mountain Express lift to the base area between 1:30pm and 3:30pm. The purpose of this lesson is to suggest minor changes or improvements to the guest’s technique, and to introduce the guest to our Snowsports instructors. Sign-up is first come, first served, same-day. Dates include: January 4, January 25, February 8, and March 8, 2015. · One set of equipment rental from Four-Mountain Sports Buttermilk to be used with lesson (one person only). · One lift ticket to be used with lesson on Buttermilk (one person only). · One discount coupon for lunch at either The Cliffhouse or Bumps restaurants. · One discount coupon for selected products at Four-Mountain Sports Buttermilk. · Full day private lesson for up to 5 family or friends. Valid January 10 through February 1, 2015. Reservations and pre-payment are required. For more information, visit http://www.aspensnowmass.com. • Lunch on the 2nd and 3rd day. Upon graduation and completion of the third lesson, Copper will award participants a free season pass so guests can progress further on the slopes for the remainder of the winter. Quantities are limited, must be purchased in person at Copper Mountain. For more information, please visit www.CopperColorado.com. During the month of January, first time skiers and riders, ages 15 and older can sign up for an Adult First Time Beginner Adventure lesson with the Crested Butte Ski + Ride School for $59 through the popular ski deals website Liftopia. The package includes a 1-day adult lift ticket, valid for limited lift access on the day of the lesson. The offer is limited to one voucher per person. For more information, visit http://bit.ly/13i0G9z. 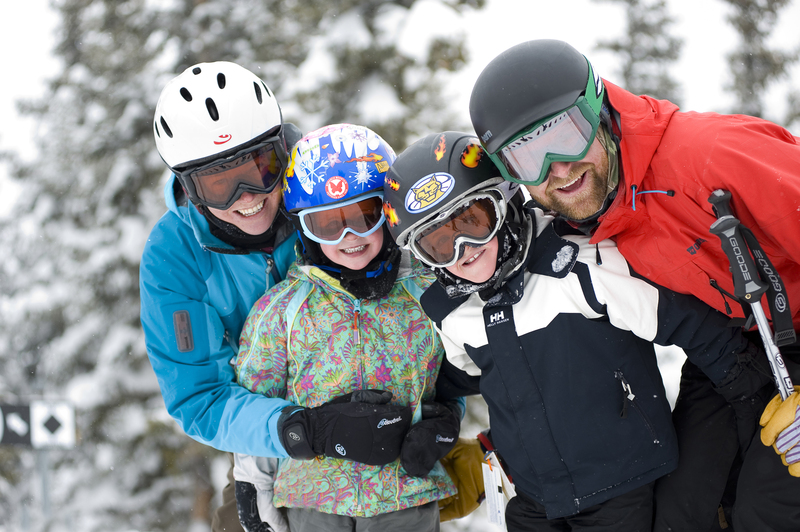 Eldora Mountain Resort (EMR) is offering the Mountain Explorer 6PAK children’s learn to ski and snowboard package for $540. The 6PAK includes six days of all mountain lift tickets, all day rentals, and all day lessons, with snacks and lunch. Reservations are recommended; visit http://www.eldora.com/lessons.children.html for more information. For adults, EMR is offering the EASY 1-2-3 3PAK for $199. The 3PAK includes three days of lower mountain lift access, all day equipment rentals and 2-hour lessons. Visit http://www.eldora.com/lessons.daily.html for more information. All children (ages 4-14) regardless of ability, who pre-purchase or complete 3 full day lesson packages, receive a free, unrestricted season pass to keep practicing their skiing or snowboarding skills for the rest of the season. Children’s full day lesson packages include lesson, lift access, rentals (ski or snowboard) and lunch. Full day lessons are from 10am through 3:30pm daily. Phone reservations are available or register at the Loveland Valley between 8am and 9am. Pre-Purchase Price: $321 for ages 6-14 skiers & snowboarders (Includes Season Pass); $345 for ages 4-5 skiers (Includes Season Pass). 3-Class Pass for Newcomer Adults: The 3-Class Pass for adult first-time skiers or snowboarders is now available for pre-purchase. The pre-purchased package includes one All Day Newcomer and two half day Master the Mountain lesson packages. Upon completion of their third lesson, guests will receive a full, unrestricted Loveland Season Pass. Lesson packages include lesson, all-day lift access and equipment rental. Phone reservations are available or register at the Loveland Valley between 8am and 9am. Pre-Purchase Price: $316 (Includes Season Pass). Adult Novice/Intermediate 3-Class Pass: The Pre-Purchase program includes three 1/2-day Master the Mountain, full lesson packages, and an unrestricted Season Pass valid all season upon pre-purchase. Lesson packages include lift access and rental equipment, (ski or snowboard). Phone reservations are available at 800-736-3SKI or register at the Loveland Valley between 8am and 9am. Monarch Mountain celebrates Learn to Ski & Snowboard Month with affordable learn to ski and ride packages at the Monarch Mountain Ski and Ride School. Pricing begins at $50 for a half day youth group lesson. Visit www.skimonarch.com for details. This series is for first timers new to the sports of skiing and snowboarding. This affordable program is for any skier from age five years old and up, or any snowboarder age seven years old and up. For $149, participants will take three full-day lessons (including lift ticket and equipment rental) during any three days throughout the season. After completion of the series, participants will be awarded a non-transferable Graduate Card valid for 50 percent off any future lessons, lift tickets and equipment rentals for the remainder of the season. For more information, visit www.powderhorn.com. Purgatory at Durango Mountain Resort is offering a guarantee for new skiers and snowboarders to learn the sport at a discounted rate. For $75 from Jan. 5- 31, 2015, beginners receive a full-day lesson, lift ticket, gear rental, lunch voucher, and discounts for future lessons, rentals, etc. Participating guests save as much as 50 percent or $74 off the regular price. This year’s program includes a guarantee that beginner snowboarders or skiers (ages 7 and older) will learn to turn, stop and ride the beginner lift after completing a second day of lessons, and if not, they get another full-day lesson for free. After the first day of lessons, participants receive a card good for discounts on lessons, lift tickets and rentals for the remainder of the season through April 5, 2015. These discounts are for use of the LSSM participant only and include a 5-day lesson punch card valid for 20 percent off full- or half-day lessons; 37 percent off lift tickets; and 20 percent off ski or snowboard rentals (blackout dates apply: 2/14/15 – 2/15/15 and 3/16/15 – 3/20/15). For more information, visit www.DurangoMountainResort.com. Ski Cooper’s 3 Lessons to a Season Pass Program is available as a first time snow experience for those who have never skied or snowboarded before. Upon completion of the 3rd lesson, participating guests qualify to receive a Ski Cooper 2014-2015 Season Pass. This program is intended for a first time snow sport experiences only and geared toward adults. For more information, visit http://skicooper.com/ski-school/3-lesson-pass-program/. Ski Granby Ranch is offering a special program called Get on the Snow for $199. Participating guests will receive two days of lessons and will ski and ride free at Granby Ranch for the rest of the season with a complimentary season pass. In addition guests will receive a 20 percent discount coupon valid for a retail merchandise purchase. Black out dates apply (MLK & President’s Day Weekend), and reservations are required. For more information, visit http://www.granbyranch.com/ski-ride-granby-ranch/get-on-the-snow.html. Guests at Steamboat can build confidence while they learn in a safe, controlled, terrain-based environment with instructors that guide them every step of the way. Steamboat’s Learn to Ski/Ride Package opens the slopes with two days of lessons, rentals and lift tickets for just $199 from Jan. 5-31. For more information, visit www.steamboat.com or call 800.299.5017. Sunlight’s Learn to Shine program includes a lift ticket, lessons and rentals for three days. Once participants complete their three lessons, they will receive a 5-day pass to use at Sunlight any time during the season with no blackout dates. At $375, the three lessons can be taken on dates of the guest’s choice, whether those dates are consecutive or not. Skiers and snowboarders that participate in the Learn to Shine program are matched with top-notch instructors and will be navigating beginner terrain by the end of their first day. For more information, call 1-800-445-7931 or visit www.sunlightmtn.com.